PCS cancels contract. OlySol Wins! Pacific Coast Security (PCS) has canceled its contracts with the downtown businesses that were being organized through the Olympia Downtown Association (ODA). As we reported in a previous issue, PCS was operating what they inappropriately called “safety teams”, unless by “safety” they were keeping people safe from sleeping. They hired guards to sweep houseless folks from doorways and awnings in front of businesses. 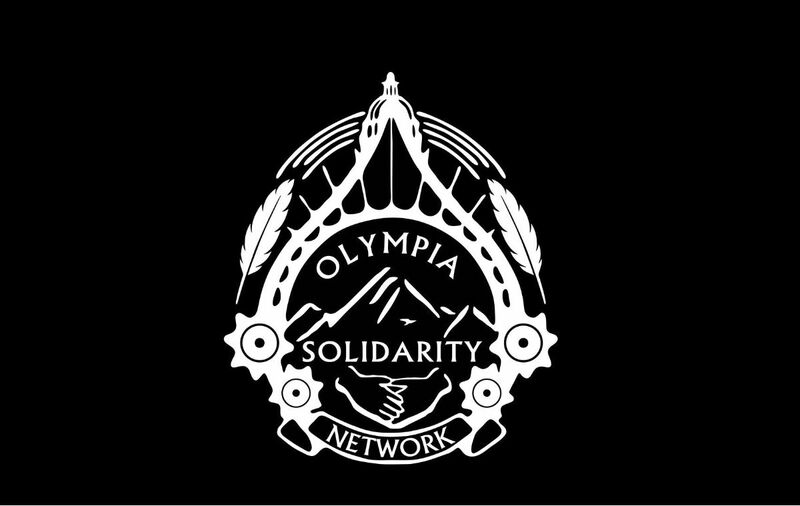 Olympia Solidarity Network (OlySol) and other concerned citizens have been demonstrating against the sweeps for the past several months, letting the ODA and PCS know that this is not the way to proceed. 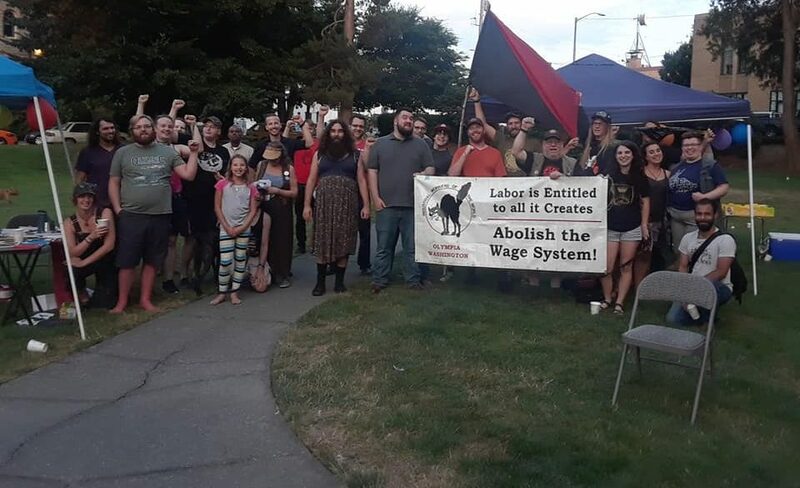 OlySol has shown once again that direct action gets the goods. The cancellation of the PCS contracts is a great win in the battle against gentrification, but there is still more work to be done. The police and conservative elements within the city government are supporting the ODA. The Artesian Commons remains closed and the city has considered selling the public lots it owns downtown in order that a private owner could then legally force the occupants off. This sounds like he is upset that homeless people are standing up for themselves, that he would prefer they knew their place. No one is “creating” a political situation here. It already IS a political situation. An economic system that profits off the backs of others and exacerbates the gap between the haves and have nots is a political situation! “John Doe 1” seems to think that the homeless can’t think for themselves. That they can’t see how they are being unfairly treated by the Powers That Be. He, and others, unjustly equate homeless people with danger. While there very well may be dangerous people who are homeless, and or, people driven by desperation, there are also very dangerous people among the housed and yet we do not blanket condemn them. Who would be the most vulnerable to the potential dangerous people downtown if not other homeless people? The people who have nowhere to go that is at all safe. These are the people who cannot rely on the police, the very police who are only barely being restrained from beating them and deporting them from town. Perhaps these business owners are afraid that the city’s actions will hurt their business. Maybe even drive them out of business. Who knows, then they themselves may end up on the street, through no fault of their own. Then maybe they would see things in a different light… but I doubt it. There is forever talk of the deserving and undeserving poor. This concept has been with us at least since Reagan. It has seeped into our culture and is thus genuinely held by some to be true. However, it is code for racism from the days of the “War on Drugs” & welfare reform. The issue we are battling here is the so-called “American Dream.” That is, the idea that if you work hard enough you will get ahead. Inversely, if you are poor you have not worked hard enough. People assume that those on the streets have made poor choices in their lives and thus it is their own fault that they are poor. This is reinforced by those of us among the poor and working poor who also hold on to the American Dream. People tend to place great weight on their own experience. Also, most of us have suffered so much at the hands of others that as soon as we are offered 25 cents more per hour and a bogus title it goes right to our heads. We have been so powerless in our own lives that the thought of having power over others is very alluring to us. The point is we have to stand together. We have to break this dynamic in our own lives. Then we can manifest our solidarity. We must make real the motto – An injury to one, is an injury to all!